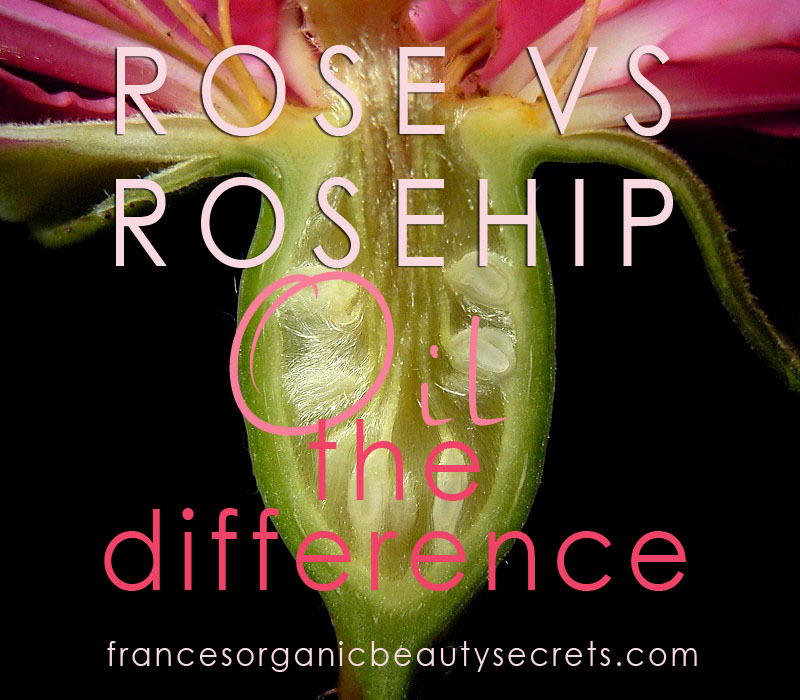 What is the difference between these two natural cosmetic ingredients? We like them both as both have wonderful anti-aging benefits for our skin and beauty…so what is the difference you ask? This is a very interesting question asked by Joanna (see link of her blog on the bottom of this post). Rose and Rosehip. They have almost the same name, they’re from the same family and yet, they are very different! The other, is known as the cynorhodon, a wild plant from the same family. 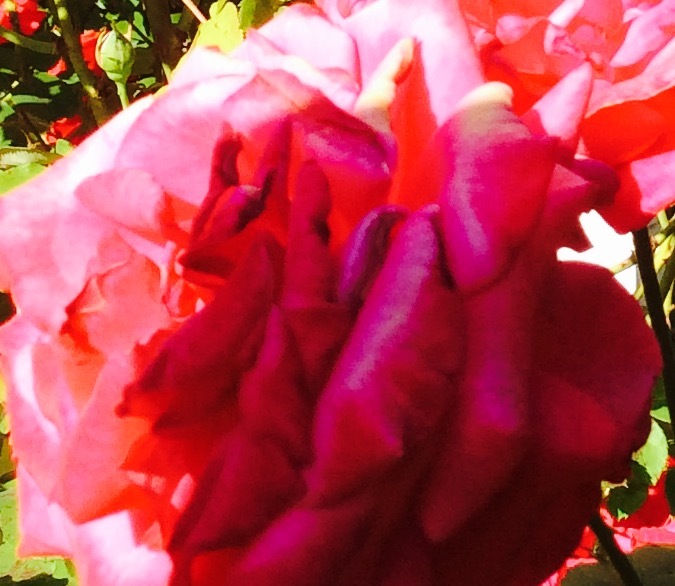 For the rose, we extract an Essential Oil by steam distillation. The only part of the plant that is used in this process (plant material) are the petals exclusively which means that the EO is highly concentrated in fragances. Mainly monoterpenols are substances which have great tonic, anti inflammatory and microstimulation benefits. Thanks to these qualities and the anti-oxidants, your skin maintains its healthy balance. Anti-oxidants are key to avoid and fight fine lines and signs of age. Rose Essential Oil also has wonderful olfactotherapy benefits (olfactotherapy is the therapy using the action of volatiles molecules of essential oils on our brain). Rose Essential Oil is definitely at the top of the list when talking about Essential Oils’ fragrances. Its fragrance help balance addictions, helps elevate your mood, balances female hormones and is even considered an aphrodisiac! Use your regular face cream and add one drop of Rose Essential Oil. Apply as usual….and start noticing the difference. The composition is mainly made-up of fatty acids and vitamin F (linoleic acid: omega 6: around 45 %) (omega 3: 30 %). It also contains small quantities of oleic acid (omega 9, around 15 %). A lack of Omega 6 can lead to intense dryness of the skin as well as allergies and skin sensitivities. This is where Linoleic Acid comes into play. It cannot be produced by our body and yet it is crucial to a healthy smooth skin. How you might ask? Well, this acid makes-up part of lipids that helps cohesion between skin cells. And cohesion between skin cells means fewer fine lines and wrinkles. Vit K: stimulates blood coagulation and therefore helps alleviate conditions such as Rosea or skin redness. Squalenes which is a great anti oxidant. Thanks to all of the above, this oil helps replenish your skin and lift-it up! 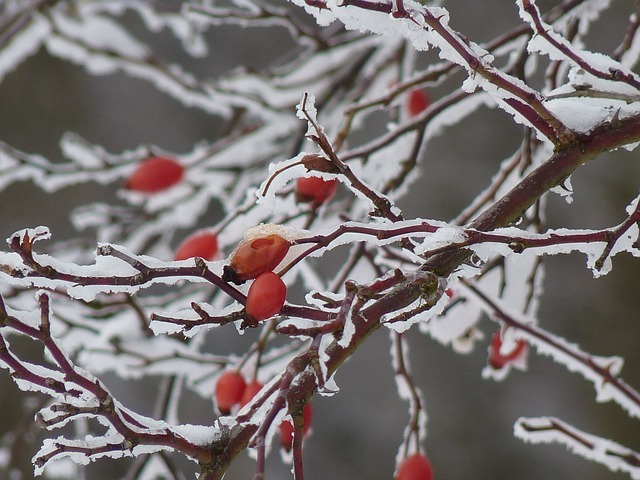 Thanks to its very fluid and penetrating texture, Rosehip Oil can be used as a day moisturizer. It is as great base before applying your make up since it doesn’t leave your skin feeling oily. It also have very light exfoliating benefits, which helps your skin get rid of dead skin cells leaving room for young cells. You can also use it as a night cream, half an hour before bed time, apply with a light massage on a cleansed skin. So, when we really want to treat ourselves…we use a few drops of Rosehip Oil, add 1 drop of Rose Essential Oil and apply the mixture on a clean face and neck with soft and gentle circular motions. Not only will this helps absorb the oil into your skin, it will also encourage blood flow. Thank you! AWESOME – an education and a shout out all in one. Bless your cotton socks!